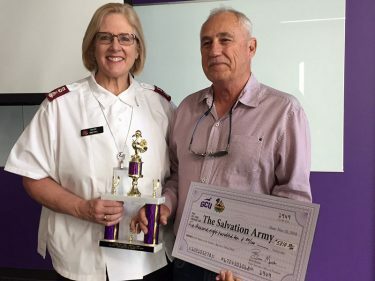 The Golden Turkey Trophy was ceremoniously presented to the employees who raised the most money during GCU’s turkey drive, and the money was donated to the Salvation Army. Grand Canyon University’s coveted Golden Turkey Trophy was plucked from its perch among “Previously Known as Peoria” employees for a brief, but memorable, check presentation Wednesday. 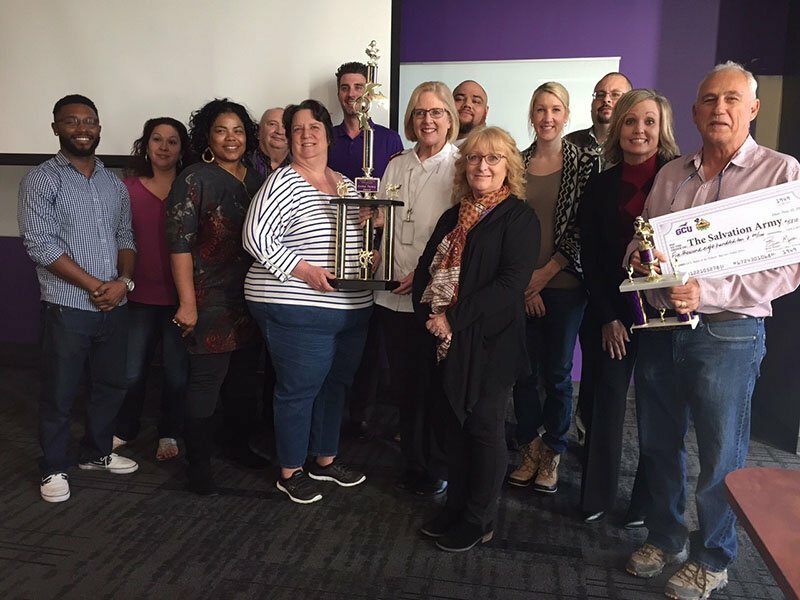 The employees, who now work in the new office building on 27th Avenue, earned bragging rights for displaying the point-of-pride prize because they raised the most money during GCU’s annual Thanksgiving Battle of the Turkeys. They collected $1,345, the lion’s share of the record $2,905 GCU employees contributed. Add to that the dollar-to-dollar matching donation from Pono Construction of Phoenix, and the total gift to the Salvation Army Southwest was $5,810. Butch Glispie (right), owner Pono Construction, hands a check of $5,810 to Salvation Army Major Nancy Dihle. The Salvation Army serves full-course turkey feasts to thousands of struggling residents. “This allowed us to serve a wonderful, warm sit-down meal to a whole lot of people who otherwise would not have had one,” Dihle said. Butch Glispie, owner of Pono Construction, can relate. A few tears leaked from his eyes as he handed the check to Dihle. Debbie Accomazzo, GCU’s community outreach manager and the GCU Foundation Run to Fight Children’s Cancer race director, who coordinated the turkey drive, was also clearly moved. She praised Glispie’s grand vision and attention to detail in the construction his company is performing at GCU. “I don’t know if I’ve ever met as generous or as humble a man,” Accomazzo said to Glispie. After a photo opportunity, the trophy was ceremoniously returned to members of the winning employee team, who are getting the bird back for the sixth straight year after raising the most donations.